Print is dead. Long gone will be the days where newspaper staff members struggle to get “to press,” where magazine editors sweat and toil over sending off final proofs to the printer. Speculators and soothsayers everywhere whisper of the e-book’s pending dominance, its utter defeat over the long time champion, The Noble Book. Paper will be an extinct technology in [insert alarming number here] years. You’ve almost certainly heard some iteration of this discussion; it’s been showing up with increasing frequency over the past two decades. Some want real books dead, calling them wasteful and outdated. Others cling to the sentimental value of books, taking into consideration the sensory experience gained from holding a beloved tale. Either way, the argument is lively and heated, with many careers and a widespread industry hanging in the balance. Whether the futurists and idealists believe it or not, there are enough extant circumstances to ensure print’s place in this world for some time to come. There are too many anchors, limitations and exceptions that exist in the “print industry” to see it wither into dust. By the way, the phrase “print industry,” the way it’s used, is a bit of a poppycock misnomer. What lies behind this whole argument is something a bit deeper. It’s the Paperless World that everyone is expecting. They have been for years. And it’s gone the way of our jetpacks and Moon-based theme parks. Let’s set the record straight here once and for all: print is not synonymous with newspaper. Too often, the decline of newspapers is equated with a move toward a paperless world. When people say that print is a dying industry, they’re often talking specifically about traditional newspaper industries, and sometimes magazines and e-books. It’s not too difficult to see that print sales — ahem, newspaper sales — are down significantly since the proliferation of Internet access. Since we’re here, let’s talk for a second about newspaper. New research out of the Pew Internet & American Life Project suggests that newspapers are more useful than anyone’s giving them credit for. You’re probably seeing a pattern by this point. Local newspapers still serve a purpose. 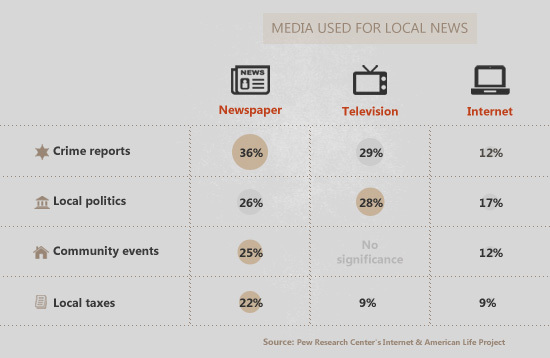 When newspapers weren’t on top, in terms of local news, television was. Almost exclusively. In fact, according to Pew, the only local news people overwhelmingly searched for on the Internet was restaurant/business-related. In other words, they looked up menus, hours, directions, etc. Sure, there are web publications that are trying to get the jump on the local news beats. But several of them are content farms (such as Examiner.com), and others, like AOL’s Patch effort, have yet to prove that they can be at all profitable. With low page views, it’s not looking good. Regardless, it does seem like newspapers will be the first print-based communication to go fully digital. After all, when the business heads behind the big papers — New York Times, Boston Globe, LA Times and so on — figure out how to make their online presence profitable (because that’s still a major challenge) of course they’ll shut down print operations. When dead-print proselytizers aren’t citing newspaper sales as the pudding’s obscured proof, they draw books kicking and screaming into the argument. Their sales have indeed been affected by e-book sales — Amazon recently announced that for every 100 print books sold, 105 e-books were sold. As grim as this looks, print — all methods of paper production and consumption for use in communications — is still a remarkably huge player in day-to-day corporate and governmental operations. And until that changes, paper and printed materials aren’t going anywhere. There are a number of factors that precede widespread technological change. In order to consider this on a wide scale, we have to look at the adoption of technology — in this case, the abandoning of paper for electronic substitutes — in terms of a social construct. The innovation already exists. No one can really argue that. There’s no good reason we haven’t achieved the mythical paperless office if we’re going on technology alone. We can read PDFs on our computers and mobile devices. We can sign documents electronically (and do so pretty safely). We can go without checks and bank statements and invoices altogether, thanks to various online banking/money services. Oddly enough, although paperless banking isn’t close to a reality in the U.S., it is in many poorer countries. There’s no evident reason that newspapers, magazines and books aren’t wholly online now. The tech exists, and so do the means of communicating these technologies. But there are clearly barriers somewhere. Firstly, people still prefer to have paper in their hands to read. We sign things — and always have — to proclaim that we agree. There are major trust issues with going completely paperless (as can be seen in the print-is-dead documentary and Chris Farley vehicle, Tommy Boy) and it’s not just the “luddite old folks,” as said an unnamed friend and coworker of mine. Print is legacy — arguably the most prominent legacy technology we have — and as new, younger, hipper folks move into business, they’re still integrating into this legacy. Doing away with paper would likely cause a major hiccup in out-of-office communications and agreements, and that hiccup wouldn’t look too good for short-term profitability. “But Kristina,” said a trusted advisor of mine, “businesses everywhere are popping up with vows to never touch a fax machine, even to never use pens.” Even Wired magazine, in its early years, strongly encouraged its staffers to never touch a pen (see Gary Wolf’s Wired: A Romance). 20 years later, I assure you, plenty of pens are floating around. And even more paper. Start-ups simply don’t represent enough of the corporate world to be indicative of, well, anything. In fact, paper sales have remained pretty steady since the birth of online news and digital books. You can make yourself dizzy — as I have — ploughing through paper statistics, through increases and decreases, but it all basically comes out in the wash. In short, in light of the technological innovation we’re faced with, the social architecture just doesn’t exist yet for a paperless world. And these things take time. Lots of time. So while there are some elements of technological diffusion in place for the death of print to occur, arguably the most important — social architecture — just doesn’t. Not for most people, anyway. In the end, one of the most important factors of adoption is recognition of advantage, which almost always boils down to personal cost. If we’re talking on an individual level (and we should be, because even corporate decisions boil down to individual decisions at some point), it’s best to take Maslow’s hierarchy of needs into consideration. For those people concerned with cost — and that’s practically everyone if we look at the world as a whole, rather than just the top 2% in the U.S. — there’s a very high barrier to entry for banishing paper from their lives (buy a Kindle, buy a laptop, a computer, Internet connection, so on). Even in the U.S., the average combined income per household as of 2009 was around $50,000. The average household has 2.6 people. Without this social context, such technological change is unlikely to occur with any relevance. 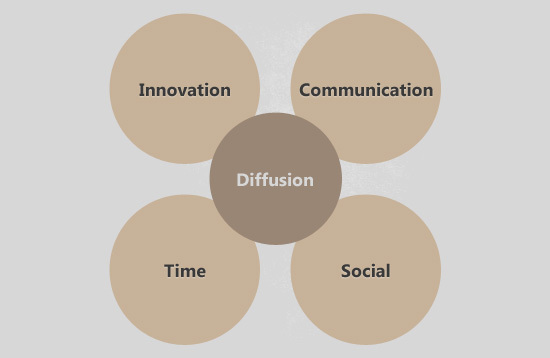 Granted, Rogers’ diffusion theories are based largely on medical and agricultural models, but the ideas behind the spreading of technologies remain similar. And yes, we can go through history and compare the printed page to any number of technologies. We can walk through the annals of obscurity and poke fun at print, comparing to the ghosts of cassette tapes, CDs, MP3s, records, radio, typewriters and anything else that’s fizzled out of the mainstream consciousness. There’s something to be said about leaving our physical mark on the world, even if that mark is incredibly wasteful. Then again, e-books aren’t necessarily any better for the environment. Paper doesn’t require a power source after its creation. Paper can be held, marked upon, shared, smelled, shredded, recycled and found just about anywhere. There’s no black market for paper, and burning it doesn’t change your DNA. Paper can be passed down through generations. And if I’m beginning to sound sentimental, it’s because I can be. Kids are still growing up with storybooks, coloring books, paper tests with grades, Highlights and so on. Even techie parents give their kids printed materials. Our world runs on paper. We have long-standing infrastructures that depend on it, from governmental to corporate. And while e-books and the Internet will probably change that eventually, it probably won’t be in my lifetime. Or yours.